Jill Sharpe wrote her first song, and started her first band, at 14. At 16, her first gig was lead singer for a band called Toxic Shock she soon got her first guitar gig for a band called The Gumby’s, then started playing guitar and singing lead vocals with an all girl Power Pop band called Tiger Lily, opening for bands like The Ventures, The Bangles, Fear, and The Ramones. She played speed metal with Flesh Weapon, Glam with The Flame Throwers and Surf with more girl bands. Jill was an original member of the all girl swing band Queen Voodoo, based in LA, opening for BB King and the Neville Brothers, performing at the Big Time Blues Festival with Canned Heat, John Hammond and Clerence "Gatemouth" Brown, etc. as well as the Blue Café, House of Blues and more. Since becoming a more seasoned player, Miss Sharpe’s vocals have been compared to Bonnie Raitt and Ella Fitgerald, her guitar work has been compared to greats from T-Bone Walker to Carlos Santa and with the nickname “Jilly Hendrix” & "Peggy Lee of the Blues" you're probably getting the idea. After relocating to Huntington Beach in the 90’s, it was time to start the Jill Sharpe Band. She moved Long Beach in 93 and began producing and recording with Wade Wilkinson (Sublime) and to this day remains the lone writer of all original material performed by the Band. Band Leader, Lead Guitarist, Lead Vocalist and producer, Jill Sharpe has been a mainstay on the Blues Scene for many, many years. This seemed the place to stay, and stay she has. 20 years later She’s still going strong and Lovin’ Every Minute of it! The Jill Sharpe Band has performed at the Doheny Blues Festival, House of Blues (LA), Mother’s Tavern, The Gig, The Little Red Rooster, Key Club, Cafe Boogaloo and Martini Blues just to name a few. She's been big on the LA Beach scene since she started, along with being recognized on many local television programs featuring the Blues, Bernie Pearl's - Bluesbreak, local Blues Cooking show - "Cooking with Lenny", and HBO's "Women in Blues". The latest, just recorded last week "Something more than the Blues". After touring as lead guitarist, for Joe Houston and the Defrosterz in both Canada and the United States, Jill came home to write, record and produce her own CD’s Take One, Swing it on Home & "Pet My Kitty". These are just a few of the many recordings Jill has kept herself involved in for the past 20 years. "Pet My Kitty" shows her growth as both guitarist, songwriter and vocalist. After years of accomplished recordings, performances and bands, Jill shows her stuff on "Pet My Kitty" with Speacial Guest Fred Kaplan (Howlin' Wolf, Muddy Waters, T-Bone Walker, Hollywood Fats, The Thunderbirds, etc, etc.) With an incredible blend of blues, swing, rock-a-billy and alternative, Jill pleases audiences from LA to Fargo, Vancouver to Austin. Recently performing at the Zydeco Festival in Long Beach, The Big Fish Blues Festival and the Children's Hospital of Orange County (CHOC Ride - hosted by Mickey Jones) with 2000 Lbs of Blues and Divas Do The Blues 1st, 2nd and 3rd Annual Female Blues Festivals(hosted by Lisa Cee) and recording her newest material for the upcoming CD "Hot Sauce". It's always a busy and really fun schedule! Last 2 shows in Los Angeles. Be sure to come out to Long Beach to see Jill & Bernie Pearl for Jill's send off. On the corner of Pine & Broadway. This is a great venue. Can't wait to see you there. Come on in, bring your Amp and Jam with the pro's. Come out & join us for the best night of blues & swing with Jill Sharpe, Mark StJohn, Evan Yearsly & Anthony Contreras. This will be a rare appearance by the tightest band in LA!!!! 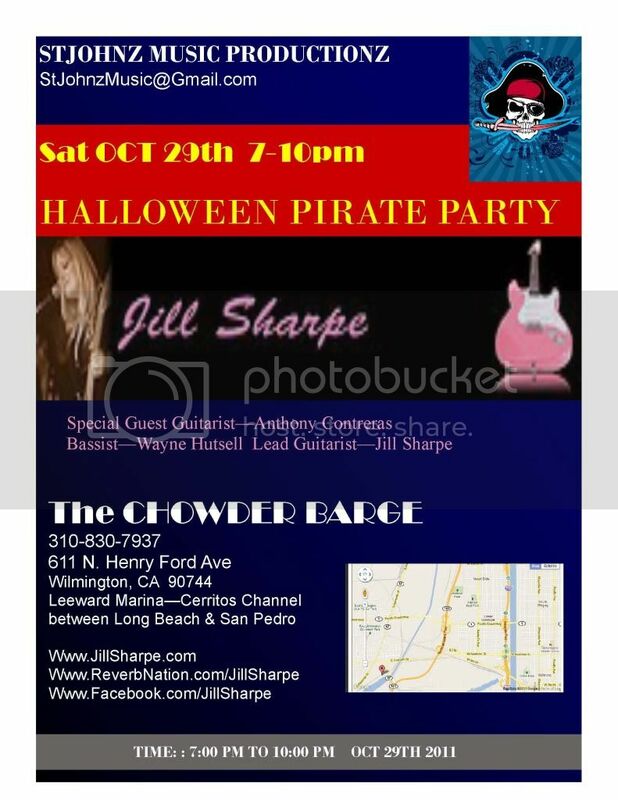 All the way from Long Beach, Jill Sharpe rocks this night for a BD bash like you ain't never seen before!! Home of the Blues in Bakersfield!!!! This is our first time here, but we know we're in good company when White Boy James & The Blues Express have been regulars at the bluesiest joint in BKRSFLD!!!! Come on in and join us! This wonderful wine bar with an extravagant menu is the most desired Long Beach location for music & friends! Bring a date or meet new friends with the Jill Sharpe Band!!!!! Come in and celebrate Jills BD with the boys! Bring your amp, guitar or stix and join some of the best players in LA!!! Come on in & show your stuff. This is a beautiful restaurant in the heart of Long Beach. Elegant beyond words, unbelievable menu with an incredible wine list, this is the place to bring a date, your wife, your best friend, or just yourself. We'll entertain you with the best Jill Sharpe & her boys have to offer with all original West Coast Swing & Jump Blues. Come join us for our first of many nights in Bliss.....525!!!! We promise you will be impressed! 525 E. Broadway Long Beach!!!! Bring your amp, guitar, stix or whatever else you need to show your stuff! Come in after NAMM and talk about all the new gear you found! We will!!!!! Come on in, dress up and have some fun - players bring your instruments and help us kick this one of to TEN!!!!! See you there! This is going to be a Great Party! Dress up as your favorite Pirate or Wench and come down to hear Jill Sharpe - Anthony Contreras - Wayne Hutsell & Tony Martinez!!!!! Come early and enjoy this floating pirate ship ...I mean restaurant and help us celebrate!!!! Greta Music - Great Friends - Great Times!!!!! Live Radio Interview with Jill Sharpe & Slobodan Dimitrov discussing the Long Beach Blues Project - photo shoot to document west coast blues players!!!! This one's important! We're taking photos of everyone I can find that has had an effect on the legendary Long Beach Blues Scene. This is being done by Jill Sharpe & Slovadon Dimitov on very old film made by Ansel Adams, It's the last of it's kind & does not exist any longer. Please be sure to spread th eword to anyone you know that should be involved. This is a DO NOT MISS SHOW! THanks for continuing to support live music in Long Beach California.....Home of the West Coast Blues!! Great BBQ, Great Music & Wonderful Friends!!!! Bring you gear & Make some new friends. Pro Blues Jam - All welcome - Bring your gear, your instrument and your friends. Come on in for some Great BBQ, Excellent Music & Good Friends. An eclectic group of fans from Bikers, to kids, moms, to the LB Roller Derby team, you never know who's going to show up here. WE LOVE EVERYBODY!!!! All shows are filmed for archival. We have an unbelievable group of players that are sure to impress. Come on in, say hello, share the music! ASHLEY'S - Special KIDS SHOW!!!!! All kids welcome this round. This is going to be a Blues Jam that caters especially to kids. If you know any kids that have unbelievable skills and want them to have the opportunity to see and play and be inspired by other incredible players, we have special guest Daniel Kostanko 10 year old drummer extraordinaire & possibly 10 year old guitarist Ray Goren. I will host all kids myself and organize and make all feel special, wanted and appreciated. Come on down and witness something incredible this Sunday! A very rare night indeed!!!!!! Swing, Vintage Jazz and Ballroom Dance! A Swingin' Night of Blues with Long Beach's own Jill Sharpe with Specials Guests. Midsummer Night's Blues, with us!!! Full Bar, Huge Dance Floor on the water in the heart of Long Beach's Marinas. On PCH, on Alamitos Bay. Come join us for a night packed full of fun! The boat comes in and out of the harbor several times during the day. The trips are short, just an hour or so and the boat comes back to dock to pick up the next round. It's a blast & very friendly. Come on down for a Mother's Day weekend extravaganza!!!! ... "It's cash only , but they have an ATM on site." ... "THE SUNDAY BLUES JAMM AT ASHLEY'S IS THE GREATEST." Spaceland - Benefit for Marty Nation - with CANDYE KANE, JILL SHARPE Julie Christensen, City Fritter and more! A benefit fundraiser for Johnny's brother, Marty Nation. Injured in a motorcycle accident in January, Marty and his family are facing some serious financial issues. Luckily, his talented rock & roll friends are coming together to blow the roof off The Satellite (formerly Spaceland) in his honor. Blues mama Candye Kane headlines the show, and there will be lots of special guests! Great Little RoadHouse - come in, enjoy the music, pull up a bar stool & have a beer - Coolest little hangout in Lakewood! Come on in, Sit Right Down, Baby Let Your Hair Hand Down! YEEEOWWWEEEE!!! WHAT A KILLER NITE FOR JAMMIN IT WAS !!! Jammer & Co-Host MARK ST JOHN here!...Howdy Folks! Reviewin' and Previewin'!.......and welcome to fun times and enjoyment of your Sunday evening at Ashley's Bar & Grill ! OH MAN!.....And don't forget the grub here...OMG...& MMMMMMM....Killer Grub at Ashley's, owner MaryRose's menu is on the table so come on down for Sunday evening dinner, a few cocktails, 3 Big Screens with the latest games on, and some of the best rockin' blues music your ears EVER experienced....!! Oh yeah, there's a pool table too..!! My Cusine Recommendation is: Try a CUP of the Chili Verde...mmm..it will tickle your tastebuds and fire up your tongue!! The best EVER....and only $3.50....wow....good price! No Kidding, this is the REAL DEAL...! Hope you get to hang out and experience it soon..!! Someone recently emailed me to ask "what makes this the best jamm as advertised?" "because of the talented and interesting JAMMERS that come here to Jam...This jam is for and about YOU....!" OUR MISSION STATEMENT FOR THE JAMM...!!! This jamm is about the Jammers NOT the band...It's all for YOU, whether you are a player or in the audience, this jam is YOUR jam, YOUR workshop, for YOUR enjoyment and pleasure, for YOUR connection power and networking of musicians and music lovers! IT'S ALL ABOUT YOU, THE JAMMERS....Hope you come and join in....!!! On Oct 31st the Sunday nite Halloween Jamm at Ashley's was unbelievable!! Host and guitarist/vocalist JILL SHARPE started the parade with some of her funky-bluesy compositions, accompianed by star jammers of the core band including bassist MARK ST JOHN, drummer MIKE HARVEY, young jammer guitarist MIKE KAHLIL, saxaphonist NEAL "the squeal" SHELTON and keyboardist LINZEE ! BLUHARP LOUIS & BOB COOPER, incredible sax player PAT ZICARI, a couple of jammer bassists, our pals RON GOLDBERG and PAUL DOMINGUEZ, and long-time 'Kansas city's Own' bassist/vocalist Sir STAN GRIGGS, who brought the house down with his version of "See See Rider"! Newcomer jammer guitarist J.C. who arrived sans the now defuct Blue Dog Jam got up to cut loose with everyone and was fantastic...thanx dude hope to see ya again...! Here's another reason why we're the best jamm in the west: because of a new gal bassist TONYA WILLIAMS, who accidentally ended up at Ashley's, stated she hadn't played bass in 10yrs, then she got up there and rocked the blues with the rest of the gang!! And she Rocked...!! Very brave gal...gettin' up there with people she just met...after a long hiatus...!! Cool stuff for all you Jammers out there..! Next Sunday nite we'll all be back to join in the parade of jammers and music lovers that show up EVERY week at Ashley's Sunday Nite blues jam, "THE BEST DAMM JAMM IN THE WEST !!" And now you know the story....See ya there or be square....hahaha.....!!!! Going to the Chapel - MARRIED!!! 4900 E. 7th Street & Park Ave. This is an event hosted by the City of Long Beach. We played the event last year and it was just lovely. We're looking forward to the event again this year, with speakers like Assembly woman Bonnie Lowenthal, First Lady of Long Beach Nancy Foster, National Alliance for Mental Illness, United States Veterens Intiative, etc. I am a huge advocate for mental health that does not seem to be handles well in our country any longer, I advise all to care for, donate to and volunteer for any event that supports those in a more difficult situation that we're in. Thank you Patti LaPlace once again for extensing the invitation to the Jill Sharpe Band. We're honored. It's fun - food and live music at Recreation Park in the Band Shell. See you there! Good Luck Racers! This is the largest annual event in Long Beach. We're right on the racetrack & the water!!!!! LB Harbor is just outside the back door. Come on down and listen to soe blues! The Irish lass herself, Miss Jill Sharpe will perform like she lives. Come out and check out the band for a fun filled holiday in downtown long beach overlooking the beautiful Pacific Ocean. Nestled in Shoreline village just next to Tequilla Jacks, Jill will make you remember this St. Paddy's day for years to come! © 2019 Jill Sharpe. All Rights Reserved. Powered by HostBaby.